For this spooky season Dangerfield has given us some of the cutest and most lusted after prints and styles. Bringing back the beloved label Black Friday and releasing some amazing Halloween and horror themed prints in both the Dangerfield main range and Revival. Being mad about all things creepy I wanted to snap up and shoot everything but for this I focused on my top 3 items for Halloween. One of my favourite musical/horror/comedies has to be Little Shop of Horrors and when I saw the samples for this season I was instantly in love with the Deliciously Fly Dress. Why looks like an adorable spring floral print is actually covered adorable little venus fly traps!! My blind blew when I saw this print and I knew that moment or day it was released would be the day it was in my hot little hands. This super lightweight (you'll wear this all the way through summer and even the cooler months with tights and layers) swing dress with a fitted bust, sweetheart neckline and a fully lined skirt. This style is a little shorter than my other Dangerfield frocks but I think due to the warmer season it's time to show a little more of my pins. I'm wearing each dress in my usual size 18 at DF and the fit is spot on. Fitted in all the right places and super flowy around my hips. This style bust as first can feel a little tight on your bust it gives for the moment you slip into it and really molds to your shape. 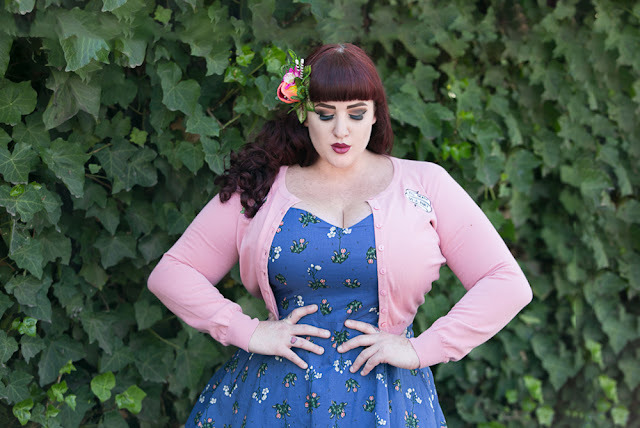 For this review/shoot I actually wanted to show you how versatile the cardigans available in store are so I chose to pair both looks with the Do Us Part cardigan in pale pink. Never did I think I'd rock pink but this past year I've really started to love the soft pale shades and this cardigan currently rocks my socks off. Featuring Frankenstein on one lapel and a scroll with the worlds 'Do Us Part' which is perfect for any universal monsters horror lover. I'm wearing the cardigan in a size 16 and I find that size fits me perfectly in all knitwear. When you have an amazing Venus Flytrap dress you need the best accessories to match and after a little searching I found the beautiful creations of Fancy Fruits on Etsy. 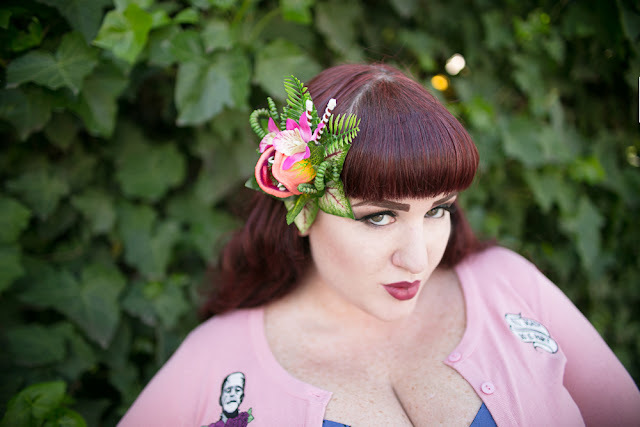 Her tiki and retro styled Audrey II hair accessories are out of this world and the fine details on each piece make my little black horror loving heart sing. I opted for mainly green style flower paired with the iconic Audrey II and with my hair and this out fit it's the perfect match. That much so I'll be using it in another photo shoot this weekend with the same theme. I'm crazy for it!! The amount of effort and handmade brilliance that went into this piece just blows me away and I can't help but put even more of her pieces on my lust list. I'll go into more detail on my next post but you can get flowers, sculptures, head bands, Disney mouse ears and more! My next look was a must have as I'm so very in love with the shape and fit of the Dead Sea Dress. On my first Dangerfield review I showed you guys the Fruit Bat Dress and since then I've been living in it. I have had some issues with tightness on the sleeve so for this style as I know I'm going to be wearing it all summer I just removed the sleeves. Another fabric version of this dress has just hit the store for summer and I'll be going sleeveless for that style as well. In an 18 this is comfortable, super roomy around the waist and bust and really flatters and slims your middle section. Even on my bad days this style makes me feel damn good about myself. Now lets focus on that print. I've always loved sea horses but now I'm smitten with the seahorse skeleton visual. It's such a strong shape and looks amazing on the black cotton and a nice change from the generic spooky skeleton. I will always by this dress as the fit is perfection and I need one a day for work. Again I've paired the Do Us Part cardigan with this frock and I really love it when matched with black and white, it just pops that little bit more. You can also snap up a men's shirt in this print so you and your love can match. There are so many options available in store and online so don't miss out on this seasons spooky goodies.